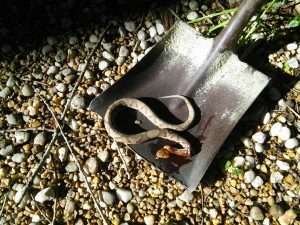 Every spring, I find a copperhead snake near the house or the hay storage and have to kill the animal. This one was under our deck, and I had a shovel handy, so its demise was quick. 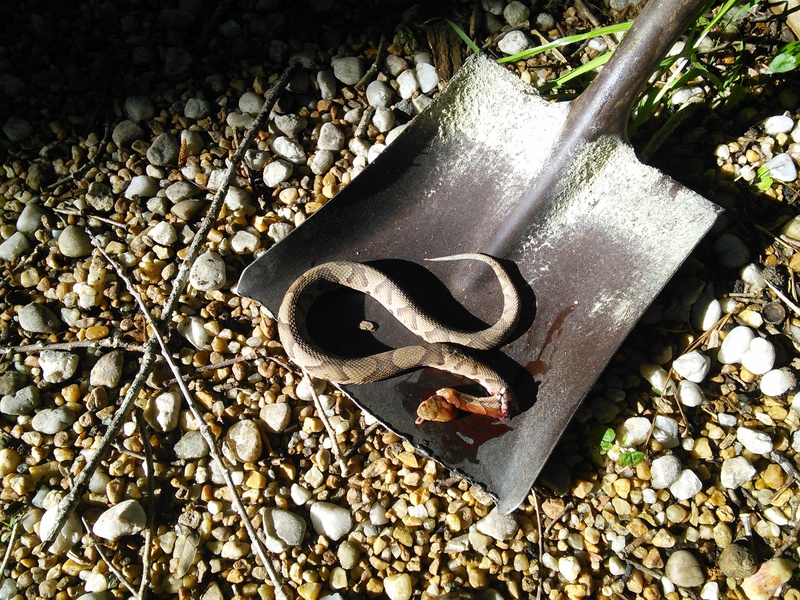 I hate to do this, but a bite from a copperhead is not trivial and I am not going to take the chance that the poisonous snake will set up shop in places we regularly run around in shorts and sandals. In the spring, the snakes migrate from their winter quarters to their summer hunting grounds. We have mice in and around the house and the hay shed, and there are all kinds of hiding places. So the snakes would be in great shape, but sooner or later I will run into them, and if I am not careful and step on one, I will get bitten. and that is a definite trip to the hospital. Relocating is an even greater risk than just letting them hang out. We did that once, and never again. Too dangerous. So, sorry snakey, but if I catch you near the house, I will have to kill you. When I run into them in the woods, no problem – you don’t bother me and I don’t bother you. They really are gorgeous animals and they help keep the rodent population in check. So seeing them out in the woods is great. This entry was posted on Wednesday, May 4th, 2016 at 9:17 pm	and is filed under Mother Earth, North Carolina, photographs. You can follow any responses to this entry through the RSS 2.0 feed. You can skip to the end and leave a response. Pinging is currently not allowed.